This tantalizing book includes 625 step-by-step photographs with the recipes and color-illustrated directions. The book opens by introducing the basics as follows: The Story of Sushi, Ingredients, Equipment and Fish and Seafood: Buying, Storing and Butchering. You are informed that making sushi is not difficult, all that is needed is the necessary foundation in the traditions and techniques from making perfect sushi rice to artfully slicing daikon. 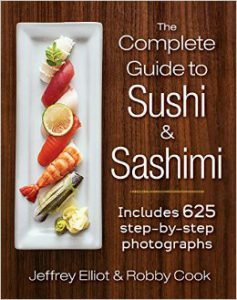 Detailed step-by-step color photographs in this comprehensive guide includes cutting sashimi and making various Types of rolls. Everything is thoroughly explained about mastering the art of sushi. You will learn how to purchase the right fish and seafood, the importance of knife selection and the differences between Japanese and Western equivalents and how to present your creations. I heartily recommend this cooking book for all novice and sushi lovers.